The mDesign Kitchen Storage Bins transform your refrigerator or freezer. 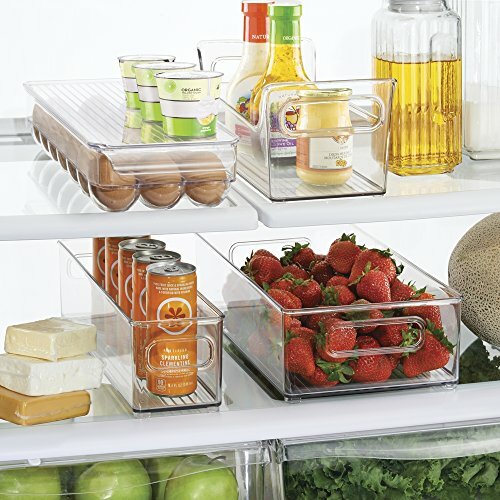 Organize produce, frozen vegetables, condiments and more with this four-piece set. It includes two bins, one condiment caddy and a 21-egg holder. Made of BPA-free plastic, it is food safe. Hand wash only. Wide bin: 14.6" x 8" x 4"; Narrow bin: 14.5" x 4" x 4"; Caddy: 5.5" x 11.25" x 5"; Egg carton: 6.25" x 14.75" x 3"